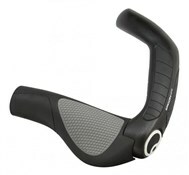 Developed for riders seeking even more hand positions. 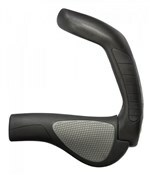 The GP1 grip combined with a multi-position bar end featuring rubberised inserts for a positive grip. Weight: 405g per pair. Made a difference, seem worth the money! These grips were so simple to swap from my stock handlebar grips. They have made a huge difference, so much more comfy they seem to fit like a glove. I love the big bar ends, I find them useful when climbing and having extra hand positions helps eliminate cramps and sore wrists. Perfect service from Tredz as ever! I've been using these for 3 months. Quite pricey but very comfy, the bar ends can be easily adjusted to get the optimal angle - they have a 7 point scale on the underneath end so you can change the angle of the bar end - give lots of variety for hand position on longer rides, also good for when climbing.